Grill, let me tell you something. This grilled salmon tropical with creamy mango salad dressing is the best easy dinner recipe for a warm summer night! Honestly. It takes under 30 minutes to pull together, and the flavors are bursting with fruity and savory goodness. 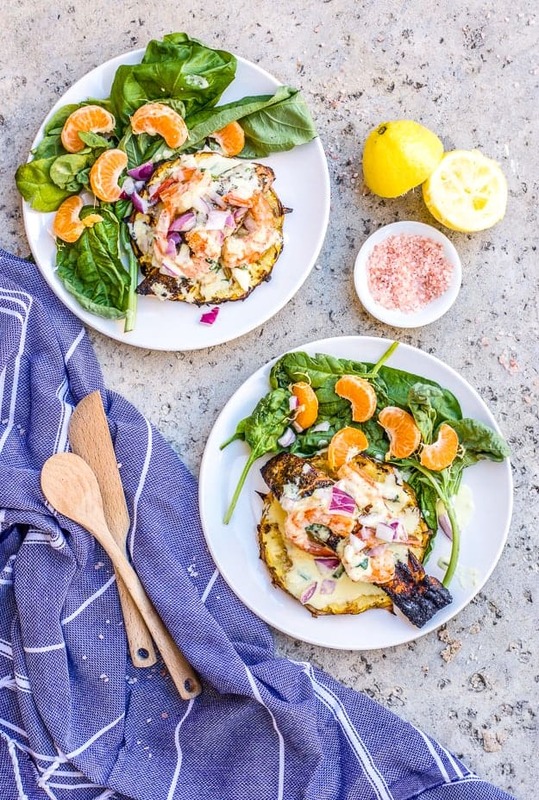 Bust out those grills because it’s time to heat up this incredible grilled salmon tropical. 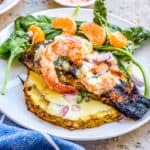 The Best Grilled Salmon Tropical Recipe Ever! We order salmon tropical at our favorite restaurant, Los Agaves, whenever we get the chance to visit Santa Barbara. 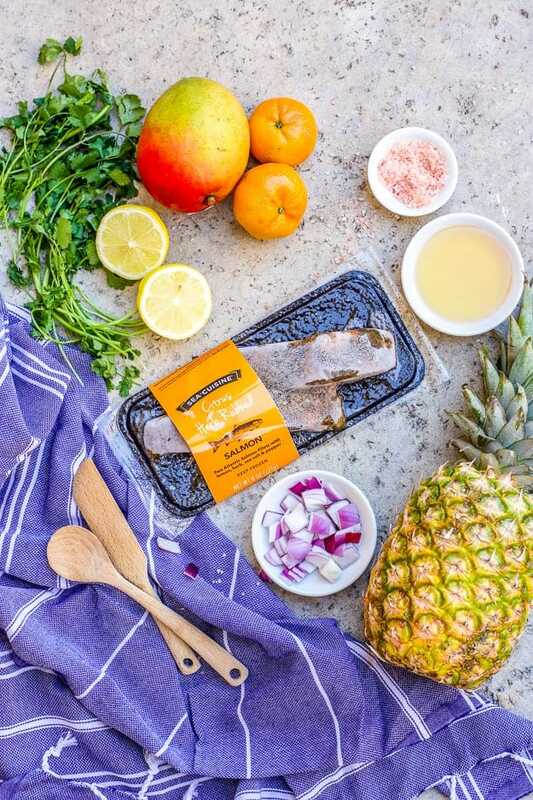 It’s the perfect mix of fruity, tropical flavors, and the savory punch of the salmon and shrimp complements the sweetness. I guess what I’m trying to say is this dish makes your brain and body healthy and happy! Listen, you do not have to know a lot about grilling to get perfectly grilled salmon. What you DO need is an accurate thermometer! 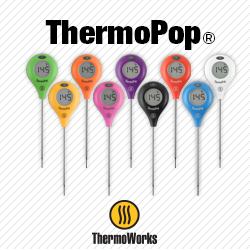 I personally use the ThermoWorks Thermapen Mk4. The Thermapen is easily the best thermometer on the market. It is used by professional chefs and kitchens throughout the world, and it gives you an insanely accurate reading within 3 seconds. Basically, don’t waste your time or money buying a cheap one on Amazon. 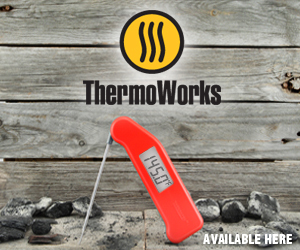 Click here to buy a Thermapen. Or the ThermoPop is a lower price point if that’s more within your range. Either one is good! You ALWAYS want to cook to temperature instead of time. Especially something like salmon that has a sensitive temperature range. Obviously, you want a ball park figure for when to check the temperature so you’re not poking excessive holes and releasing heat from the fillet. With this recipe I start checking around the 10 minute mark. The recommended temperature for salmon is 145°F. To measure most accurately, stick the thermometer directly in the middle at the thickest part of the meat. Remove from heat once it reaches this temperature. As I said before, this recipe takes only 30 minutes to prepare—beginning to end. We like to the fresh salmon from Costco and freeze them. They are good grilled or baked with a salt and pepper. Or this works great with frozen seasoned fillets. If you prefer to bake your salmon instead of grill it, simply cook in the oven on a baking sheet on 450°F, until it reaches an internal temperature of 145°F (typically around 10-15 is the best time to check.) That’s it! Super easy. 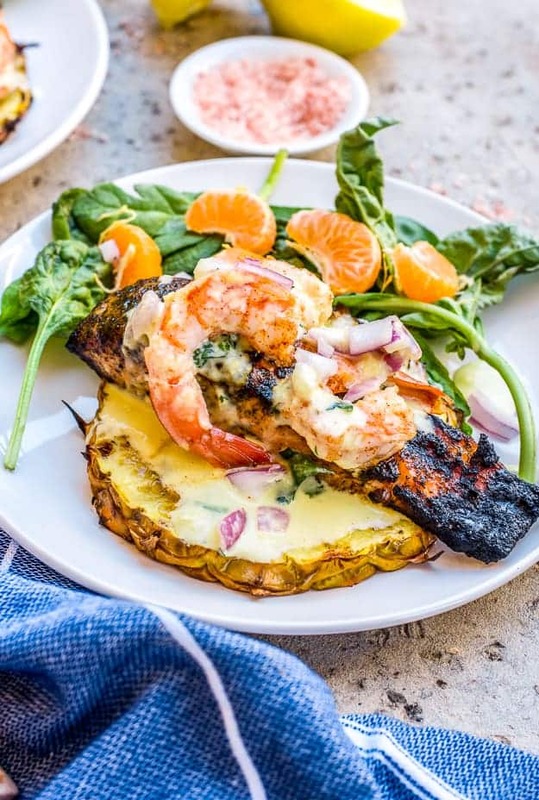 Make sure you add a good squirt of lemon on your salmon, which tastes ridiculously good with the grilled pineapple, mango salad dressing, bed of greens, and garlic shrimp in this grilled salmon tropical dish! And yes, my kids gobble it up. It is kid-tested and approved for an easy dinner recipe for family. Grill, let me tell you something. This grilled salmon tropical with creamy mango salad dressing is the best easy dinner recipe for a warm summer night! 3 cups mixed greens I prefer basil in mine for maximum flavor! Sprinkle the salmon fillets with salt and pepper on each side. Grill the salmon cuts until it reaches an internal temperature of 145°F. (It's important to cook to temperature with salmon so it isn't dry.) Salmon should be pink inside and barely flaking. Pineapple should be caramlized and soft. Mix the butter, garlic, paprika, and cinnamon in a small bowl. Add shrimp to grill and baste with butter mixture, cooking until pink and barely curled. While meat is grilling, make mango salad dressing. Pour lemon juice, avocado oil, agave, Greek yogurt, salt, and ½ mango in a blender. Blend on high until smooth. Pour in a medium bowl, and mix in remaining chopped mango, red onion, and cilantro. Chill in refrigerator to thicken and develop flavors. Prepare the bed of greens on a plate. Place the pineapple slice first, then top with salmon, shrimp, and avocado. Pour the mango salad dressing and clementines on top and serve immediately. Enjoy! If you don't want to grill your salmon or shrimp, you can bake the salmon on 450°F for 15 minutes, and grill the shrimp in a skillet on the stovetop. And can’t wait to try this! It sounds fantastic! I love Los Agaves and I can’t wait to try your recipe, however I am going to add just a hint of an adobe chipotle chili. My favorite way to prepare salmon is Blackened, with butter, and a lemon slice while eating. I like grilling it with a maple sauce.